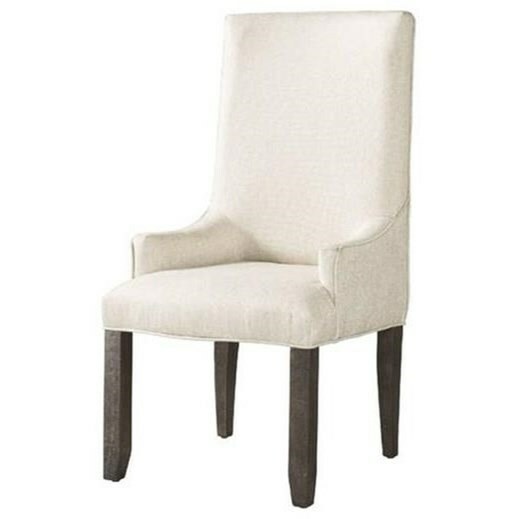 This upholstered chair draws inspiration from the classic Parson's chair with a tight, cream colored upholstered seat and back. The chair has small arms and clean square legs that taper at the end. Pair this chair with the trestle table from this collection and add a refined, yet casual table perfect for a farmhouse. 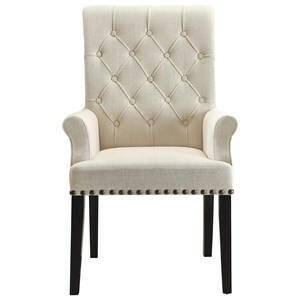 The Finn Upholstered Parson's Arm Chair by Elements International at Miskelly Furniture in the Jackson, Pearl, Madison, Ridgeland, Flowood Mississippi area. Product availability may vary. Contact us for the most current availability on this product. This dining room collection updates classic designs with subtle details, creating a charming collection perfect either a farmhouse or an urban apartment. The centerpiece of the collection, the table, has an impressive trestle base with turnbuckle metal accents. The side and upholstered arms charms have simple, yet refined designs, pairing perfectly with the table. The Finn collection is a great option if you are looking for Rustic Industrial furniture in the Jackson, Pearl, Madison, Ridgeland, Flowood Mississippi area. Browse other items in the Finn collection from Miskelly Furniture in the Jackson, Pearl, Madison, Ridgeland, Flowood Mississippi area.